Geren Island Flow Maintenance Project (OR) | WEST Consultants, Inc. The primary drinking water treatment facility for the City of Salem is located on Geren Island along the North Santiam River. The facility intake structures are located on the north channel of the Geren Island divergence. The City is concerned about the recent and potential future physical changes of the north channel upstream of the intake structures. Potential changes to channel morphology may affect the water intake structures or damage other facilities. WEST Consultants performed a geomorphic evaluation in order to understand the causes behind the change in the channel and to develop a mitigation plan in order to reduce the risk of damage or loss to the water treatment facility. As a result of the geomorphic analysis, various alternatives are being evaluated and designed to help stabilize the channels, ensure adequate flow to the intake, and provide habitat enhancement. 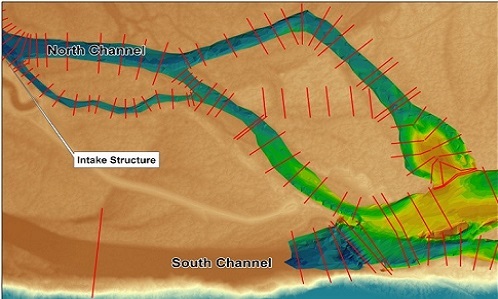 The alternatives include dredging of the channel upstream of the divergence to encourage flow into the north channel and engineering boulder riffles to increase channel bed stability, large wood structures to redirect flows, and bank stabilization features to reduce erosion. A key challenge to the selection of alternatives is to ensure flow is properly distributed in both the north and south channels, while maintaining a minimum water depth at the intake structure. Ensuring proper flow levels in both the north and south channels is critical for maintaining habitat for endangered or key species such as the Oregon chub, Upper Willamette River steelhead and Upper Willamette River Chinook salmon.